a range of wines coming from top quality growers, eager, like ourselves, to produce wines with a pure expression of their «Terroirs». The Château de Beauregard wines and the «Joseph Burrier Selections» are on sale at the Oenothèque Georges Burrier in the Village of Fuissé. Our Beaujolais Villages shows a dark colour with ruby lights. 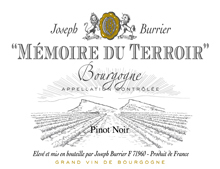 It reveals intense red fruit aromas, the mouth is round, full and fleshy. Nice finish with supple tannins. Keeping potential: 2 to 4 years. Serve between 14 and 17Â°C in convenient glasses. â€˜Les Belouzesâ€™ matches well with delicatessens, grilled red meats, poultry and not too matured cheese. 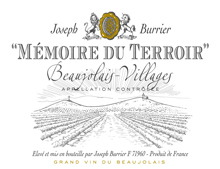 Our Beaujolais Villages â€˜Terroir Memoryâ€™ shows a dark colour with ruby lights. 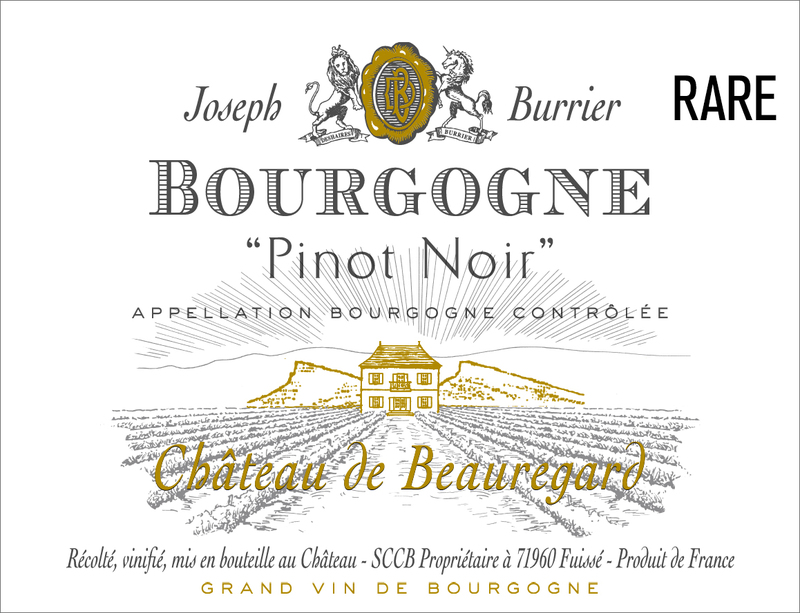 It reveals intense black fruit aromas, the mouth is round, a little rustic but full and fleshy. Nice finish with supple tannins. 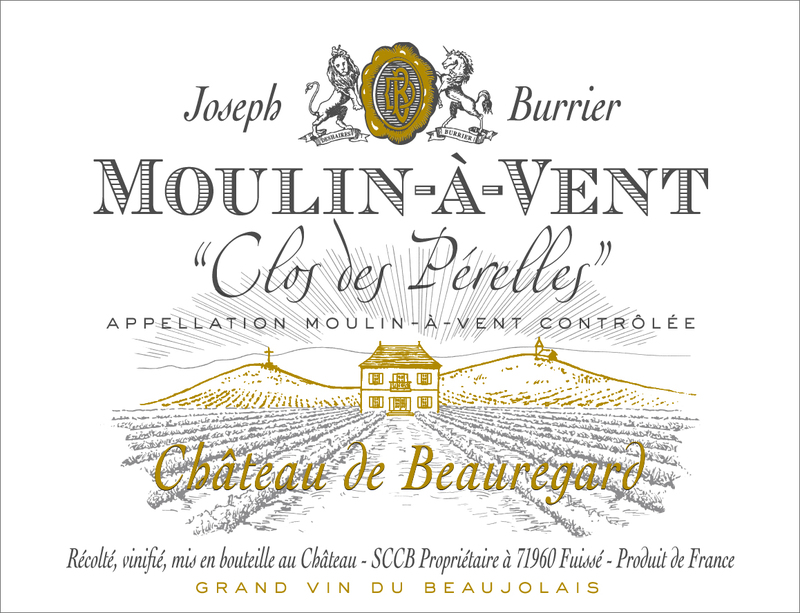 The best moment to drink this wine is between 2 to 4 years after bottling. Serve between 14 and 17Â°C in convenient glasses. This is a typical â€˜casse croÃ»teâ€™ wine. It matches well with delicatessens, grilled red meats, poultry and not too matured cheese. The colour is deep, black cherry and blackcurrant aromas precede spicy flavours of ripe tannins. The best moment to drink this wine is between 3 and 5 years after bottling. Serve between 15Â° and 18Â°C in convenient glasses. 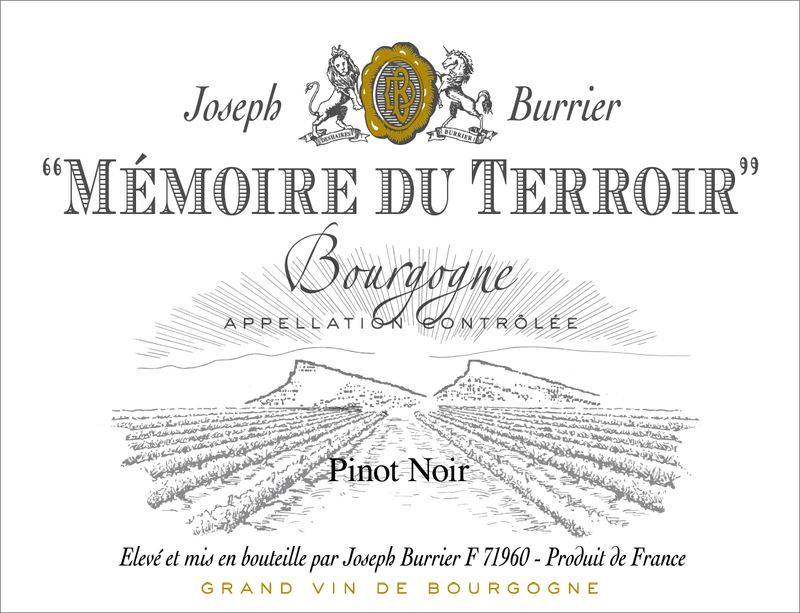 Our Pinot Noir matches well with roasted and grilled red meats, game bird, poultry and not too matured cheese. Our ChÃ©nas â€˜Les Darrouxâ€™ reveals a deep ruby colour, almost purple. Floral notes match with spicy hints (white pepper). 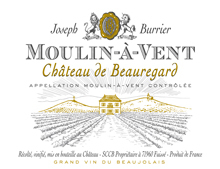 In mouth the ripe tannins sustain concentrated red fruits (redcurrant, strawberry) aromas. Clean finish, lightly iodized. 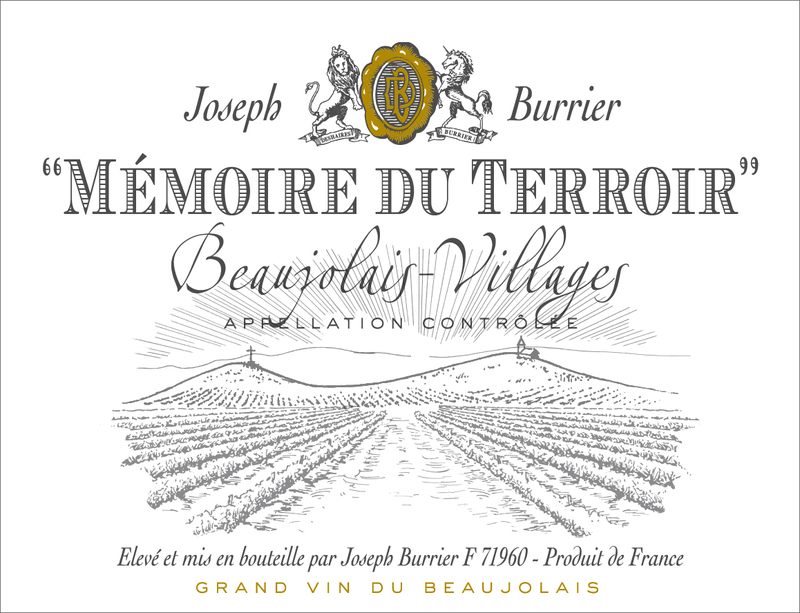 The best moment to drink this wine is between 3 to 5 years after bottling. Serve between 14 and 17Â°C in convenient glasses. 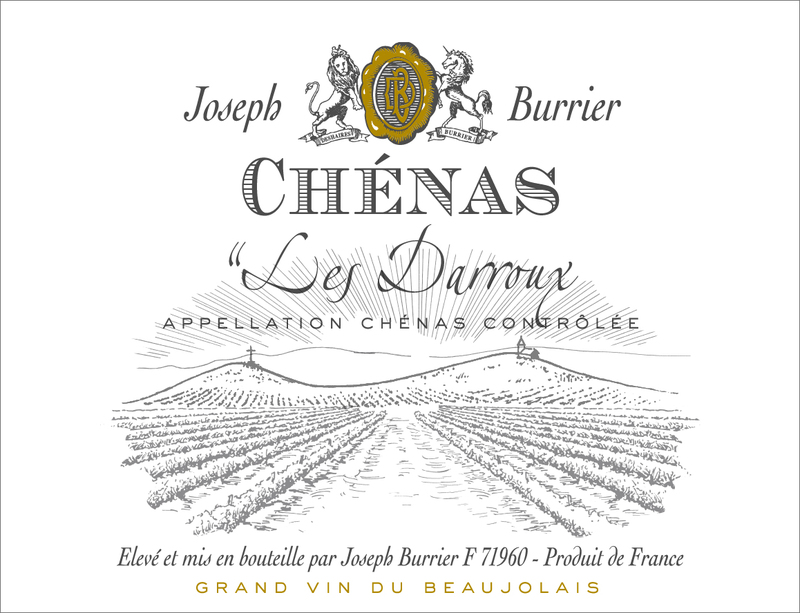 Our ChÃ©nas â€˜Les Darrouxâ€™ matches well with delicatessens, grilled red meats, game birds, â€˜Coq au vinâ€™ and not too matured cheese. Our Chiroubles â€˜Saint Rochâ€™ reveals a deep ruby colour, and red berries and cherry on the nose. 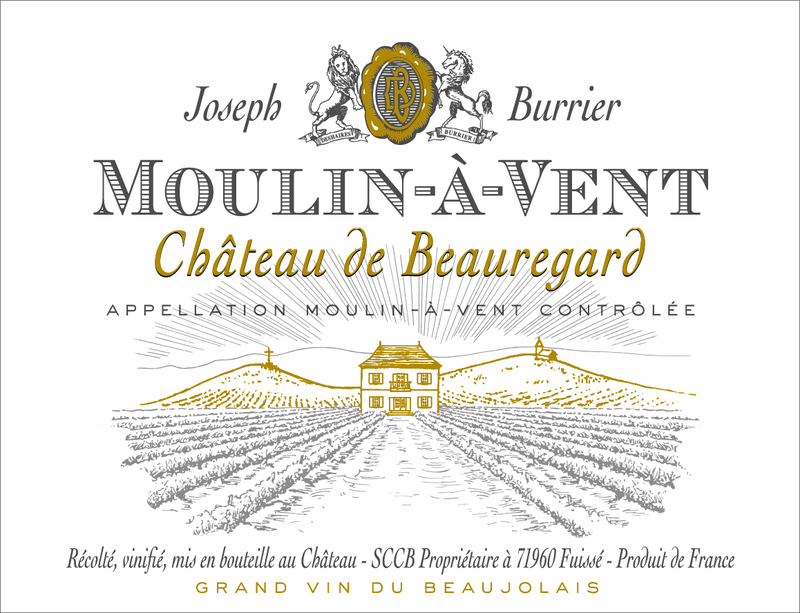 The medium body mouth expresses red fruit flavors and some spicy notes. The finish is smooth, sappy and nicely persistent. Keeping potential: 3 to 5 years and over for good vintages. Serve between 14Â° and 17Â°C in convenient glasses. 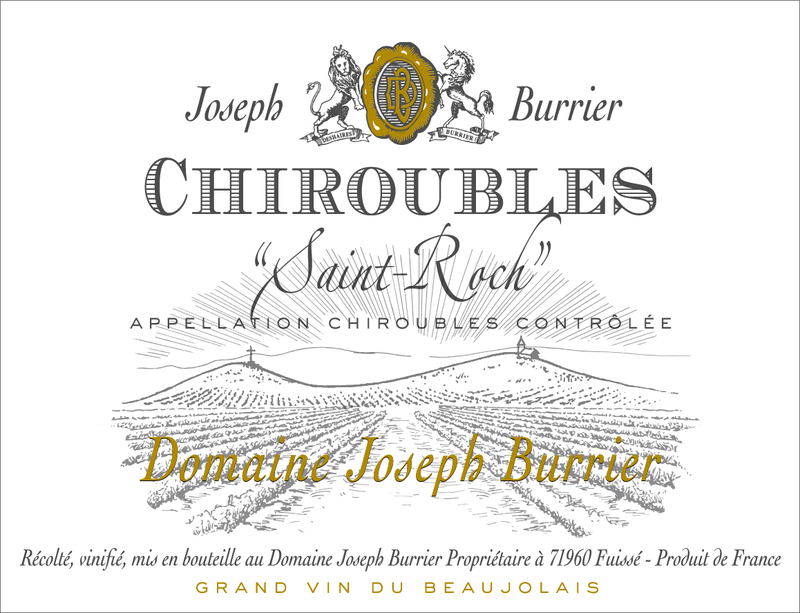 Our Chiroubles â€˜Saint Rochâ€™ will perfectly match with delicatessens, grilled red meats, poultry, game birds, â€˜coq au vinâ€™ and not too matured cheeses. 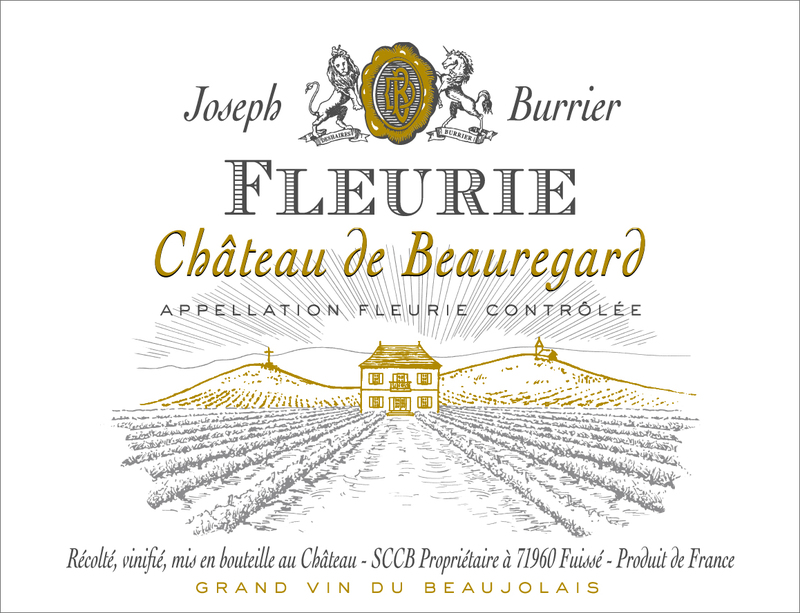 The chÃ¢teau de Beauregard Fleurie is among the most structured of the Appellation, reminding the Moulin Ã Vent style. 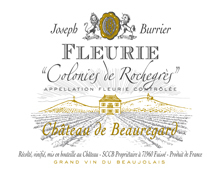 It reveals floral aromas (iris, rose petal and violet), dry hay, red fruits (strawberry, blackcurrant). The mouth is velvety and structured. Aging capacity: 5 to 8 years. Serve between 14 and 17Â°C in large crystal glasses. The wine will enhance roasted lamb, white meat, poultry and of course a â€˜saucisson de Lyonâ€™ or Burgundian delicatessen. The wine reveals a good structure together with the aromatic complexity of ripe fruits (spices, plum, peony and violet). The mouth is fleshy and jammy with a long finish. Keeping potential: 5 to 8 years. Serve between 14 and 17Â°C in large crystal glasses. The wine will enhance roasted lamb, white meat, poultry and of course a â€˜saucisson de Lyonâ€™ or some Burgundian delicatessen. 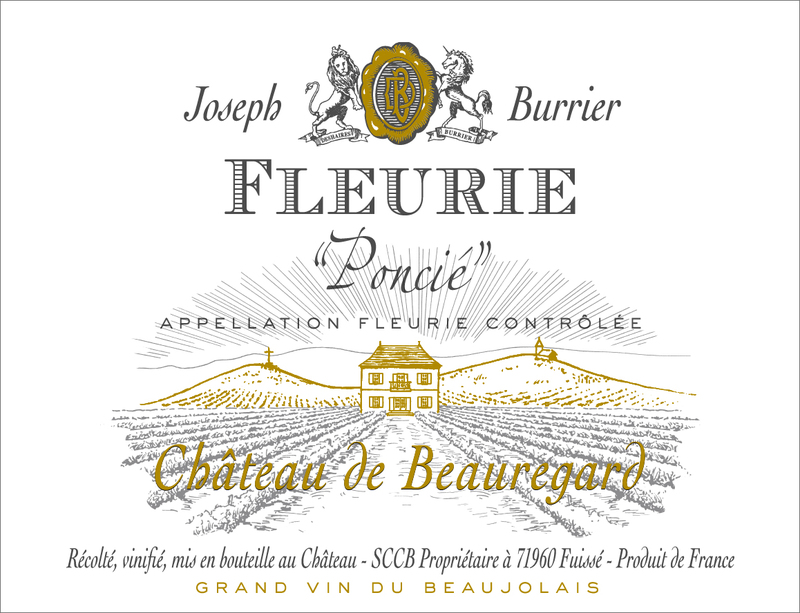 Our Fleurie â€˜PonciÃ©â€™ reveals a fine elegance due to the shallow granite and expresses a mix of floral (iris, rose petal) and fruit (strawberry, blackcurrant) aromas. The mouth is complex, intense and smooth. Our JuliÃ©nas shows a deep ruby colour. 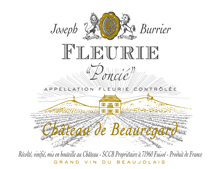 The generous bouquet reveals ripe fruit (plum, redcurrant, strawberry) and flower (peony) aromas. The mouth is gourmand, concentrated and lightly liquoriced. Clean and fresh finish. Serve between 14 and 17Â°C in convenient glasses. 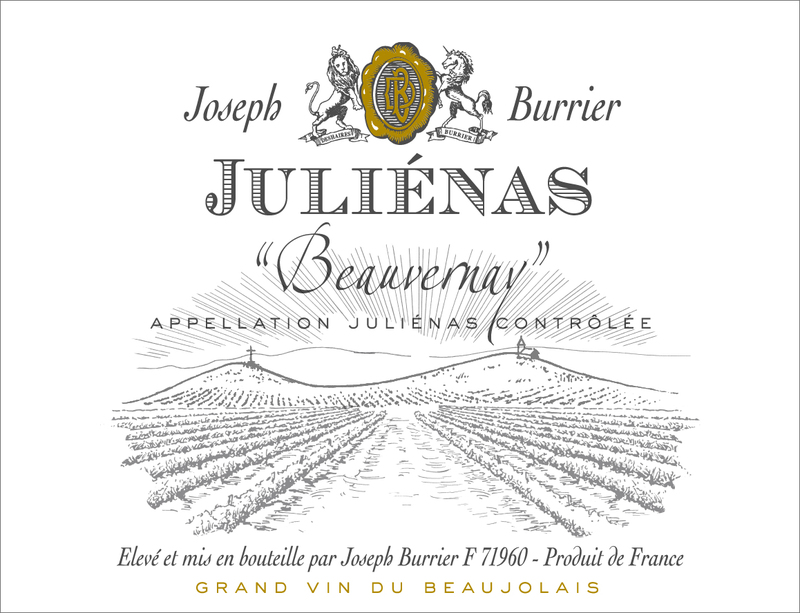 Our JuliÃ©nas â€˜Les Paqueletsâ€™ matches well with delicatessens, grilled red meats, game birds, â€˜Coq au vinâ€™ and not too matured cheese. The wine shows an almost black color and expresses plum, black cherry and spicy aromas. The mouth is full, deep, complex, still dominated by spices (pepper, cloves) with some wild hints remembering the great RhÃ´ne valley wines. Serve between 14Â° and 17Â°C in large crystal glasses. Our Morgon will enhance grilled or 'en sauce' meats, 'coq au vins', game and not too matured cheese. This deep ruby colored wine expresses red fruits (strawberry, blackcurrant) and flowers (iris, rose petal and violet). Aging capacity: 8 to 10 years. Serve between 14 and 17Â°C in large crystal glasses. Our Moulin Ã Vent matches well with grilled or â€˜en sauceâ€™ meats, â€˜coq au vinâ€™, game and not too matured cheese. It reveals a deep ruby colour, a complex bouquet mixing floral and spicy notes with red fruit aromas. The mouth is broad, dense, full bodied and the finish is nicely persistant. 5 to 10 years and more in the great vintages. The 1912 vines give a deep ruby colored wine. 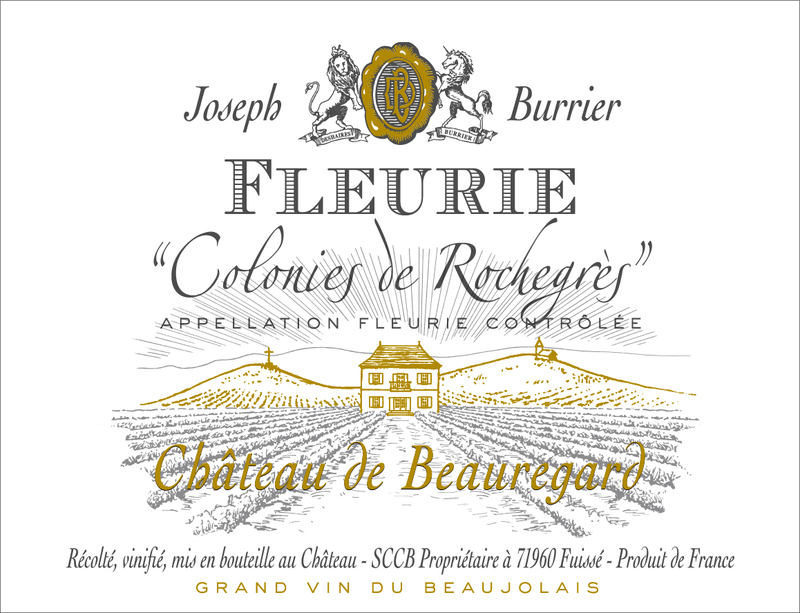 The bouquet is complex, a blend of spices and red fruits (strawberry, blackcurrant) and subtle floral aromas (iris, rose petal, violet). The mouth is elegant with well matured tannins. More than any wine of Beaujolais, 'La Salomine' specific style, intense and very elegant, engender frequent comparisons to great reds from northern Burgundy. 5 to 10 years and more for great vintages. Serve between 14 and 17Â°C in large crystal glasses. 'La Salomine' matches well with grilled or â€˜en sauceâ€™ meats, â€˜coq au vinâ€™, game and not too matured cheese. 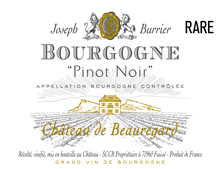 The wine shows a bright ruby color, intense but not very deep and reveals cherry, rapsberry and strawberry aromas. The mouth is pure, light but with a good intensity, complex and dominated by small red fruits, gingerbread and white pepper. Serve between 14Â° and 17Â°C in large crystal glasses. 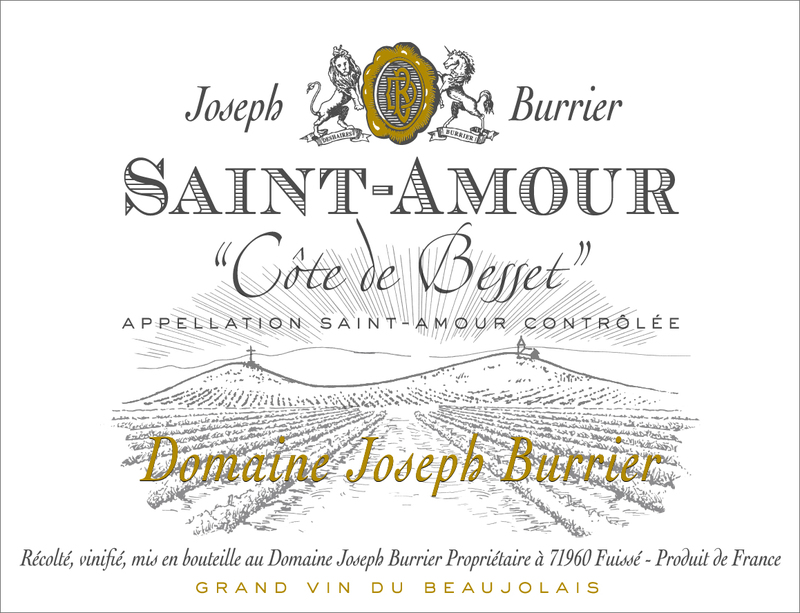 Our Saint Amour will enhance roasted lamb, white meat, poultry and of course a 'saucisson de Lyon'.